Adolescent girls from across the Pacific have voiced their desire to be part of the development process at the Pacific Girl Regional Stakeholders’ Dialogue. 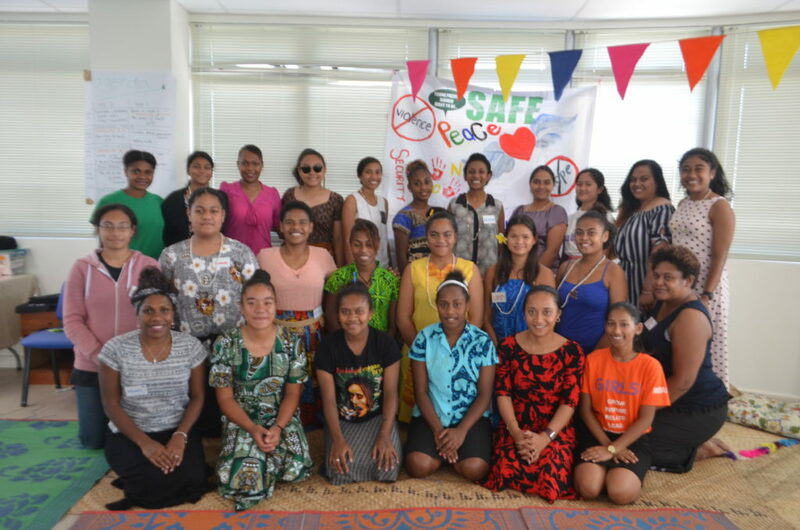 Throughout five days of discussions in Fiji in May, girls aged 15 to 19 from Tonga, Vanuatu and Fiji spoke of the common issues affecting them. Pictured: Rachel Lume speaking during the Stakeholders’ Dialogue opening. Photo credit: Pacific Women Support Unit. ‘Some of the challenges that girls are facing in our countries are teenage pregnancy, access to education, safety, custom, culture, religion and cyberbullying,’ said Rachel Lume, 17, from Vanuatu. 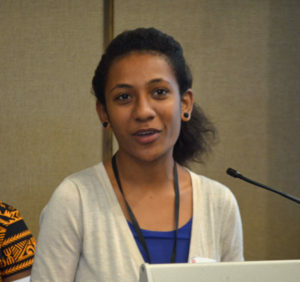 Speaking at the opening of the Stakeholders’ Dialogue, Roselyn Sidal, 17, from Fiji encouraged her peers to take pride in their leadership capabilities. Pictured: Roselyn Sidal speaking during the Stakeholders’ Dialogue opening. Photo credit: Pacific Women Support Unit. 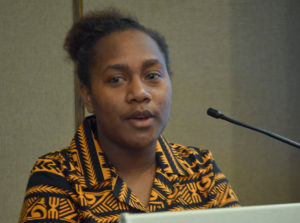 Ms Sidal was among 20 Pacific adolescent girls who attended a two-day priority setting meeting ahead of the Pacific Girl Stakeholders’ Dialogue. Both meetings were important consultations for the design of Pacific Girl programming, which aims to amplify the voices of adolescent girls, work with groups that specialise in their needs and ensure their inclusion in adolescent-focused programming. Pictured: Participants of the Pacific Girl Regional Stakeholders’ Dialogue. Photo credit: Pacific Women Support Unit. The group discussed issues including leadership, sexual reproductive health and rights, and gendered social norms, and proposed solutions to some of the key challenges facing adolescent girls in the region. ‘We have come up with solutions that will help eradicate these problems faced in the Pacific,’ said Ms Sidal. These included a range of interventions, from curriculum reform to an increased engagement of parents. At the heart of the change is the vision of a better Pacific for adolescent girls. The Australian Government is pleased to support Pacific Girl as part of its Pacific Women Shaping Pacific Development (Pacific Women) program. Through Pacific Girl, Australia is working with interested partners to help create a better future for adolescent girls and young women. ‘I want every girl to understand their rights and know who they are,’ added Kelly Tombu, 18, from Vanuatu. Anamalia Falemaka, 15, from Tonga, wanted to see ‘girls becoming leaders’ in parliament and town councils. Of the 20 Pacific adolescent girls who attended the weekend meeting, six went on to join the Stakeholders’ Dialogue. Pictured: Pacific adolescent girls who attended the two-day priority setting meeting with their appointed guardians. Photo credit: Pacific Women Support Unit. In addition, the voices and lived experiences of Pacific adolescent girls who could not attend the meeting were also heard in the room through Pacific Girls Speak. Prepared by Plan International Australia, Pacific Girls Speak is a video presentation developed as part of the design consultations for Pacific Girl. The priority setting meeting and Stakeholders’ Dialogue are just the beginning of Pacific Girl. The design process will continue in collaboration with partners to develop the most effective way forward. The two-day Pacific Girl priority setting meeting was held at the Moana Anglican Services and Teaching Centre, Suva, on 12–13 May 2018. 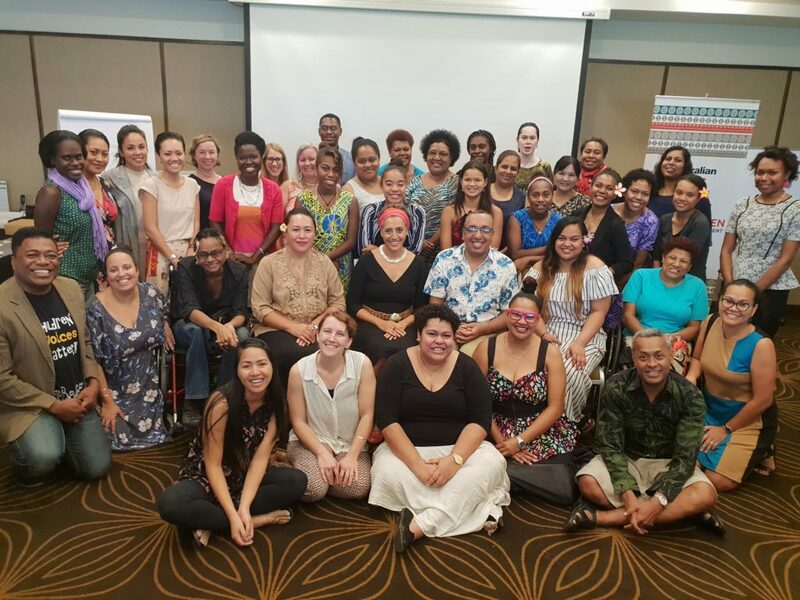 The three-day Pacific Girl Regional Stakeholders’ Dialogue was held in at the Holiday Inn, Suva, on 14–16 May 2018. Pacific Girl is a Pacific Women Shaping Pacific Development (Pacific Women) project that focuses on adolescent girls, aged 10 to 19 years, and seeks to amplify the voice of girls, work with groups that specialise in adolescent needs and ensure girls inclusion in adolescent-focused programming. While adolescent girls are the principle focus, boys, parents and carers and communities will be included to promote gender equality and better development outcomes. Pacific Girl recognises the fluid definitions of ‘girl’ and ‘young woman’ in the Pacific Island context and will not follow a rigid age definition for supported initiatives. Pacific Girl will prioritise programs which adopt a partnership or youth-led participation model, particularly when seeking to engage older adolescents.